Now this is one of the historic moment for every cricketer and also the fans from both the nations, INDIA and PAKISTAN. The stage was set all at its best. The top most dignitaries from the two neighbouring countries where all set tyo witness a clash of the titans. One team being the top one from its group and highly energetic with the bunch of young players and the other one as the most favorite team of the tournament. Pressure equally mounting on both the teams with the extreme expectations grounding down under the skin of every player. The day had started well with a clear sky and flying flags. 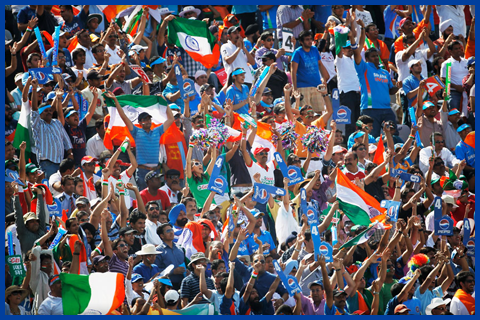 The satdium was jam packed with a cheering crowd always on its feet to support their nation. What more can you expect?? The arch rivals were on a head on clash. A day i must note down is what i felt as a cricket loving fan. 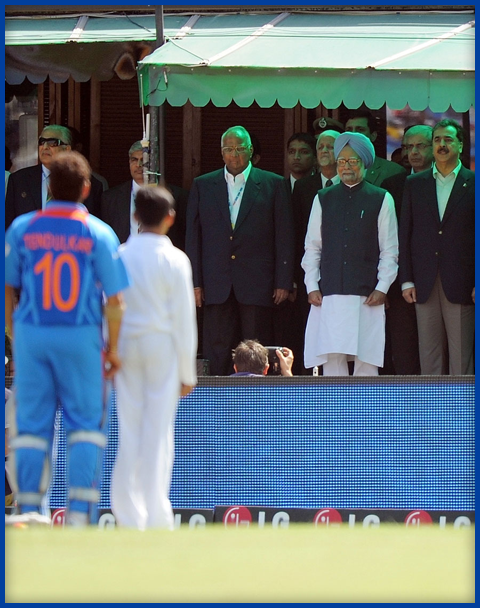 India won the toss and elected to bat. With a great firing start from sehwag who had done all the damage in the first 5 overs and the wind had gone silent as the Sultan of Mulatn departed. Then things were very ordinary with the master going very tentatively. There were lots and lots of mis fields and catches dropped by the team Pakistan, they might have to pay for this and dropping Sachin can be the sign of your poor day. But stilll with some fabulous bowling by the new youngster “Wahab Riaz” taking the % wicket haul and assuring to keep team India at a decent score of 260. Not a mountain hard to climb, looks very much chaseable. A great clash is assured for sure. The Pakistan too had their great start, with almost giving up no wicket and making sure they have a smooth start. Finally the opening cashes with Kamran perishing in the over 9, and PAK is at 44/1. Then there were no real partnerships were building up, wickets were clearly falling one after the other in the equal intervals of time. Hold back, here comes the BOOM BOOM Afridi, with PAK 150/6 and a required run rate of about 8 and above things still can go the other way. Afridi was all looking to go down the track, and one bad over was all setting things a bit for Pakistan. And here again team India gets back with a magical delivery of Bhajji to make Afridi play over and get caught. NOw Misbah on the other all alone and pushing hard to play all the 50 overs and make sure he drives his team to the 261 target. This was as said in the commentry, now had become a match between the 11 Indian players and ! man from Pakistan, as they lost all the 9 wickets. Things were getting worst for Pakistan, as it was getting closer and Required Rate going up up to climb the everest. It was then the need of 30 from 6 balls, a chase that never happened, but this is crciket. Though it did not ahppen today and so we won with the best bowling figures from our bowlers who were all criticized through out the tournament. Hard luck Pakistan, you guys were fabulous. Finally India makes it to the final and its the real clash there against Sri Lanka on the 2nd of April 2011, Saturday. Was great to witness the whole match. Pakistan team, which was never considered as a favorite and were under rated with all the controvercies surrounding the whiole team but still the young dynamic team under the leadership of the Boom Boom Afridi made to the Semi Final after topping their group in league. Hard luck for the day but lot to cheer about and to go ahead with some real moments to cheer and celebrate.